Personal touches and pretty wedding style came together for this couple’s perfect celebration. 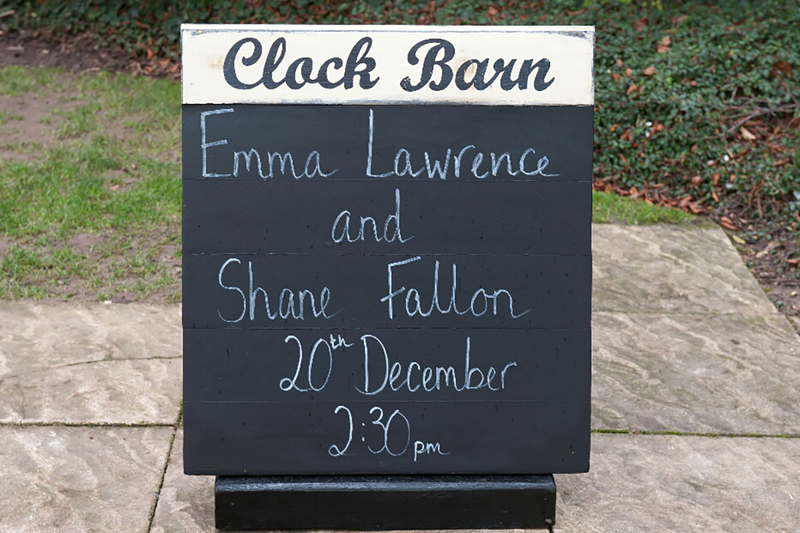 Emma and Shane were keen to put their own mark on their December wedding day. They wanted their celebration to be truly unique and for all their guests to have an amazing time. While the pair had high expectations for their day, they did want their celebrations to feel relaxed. They also wanted to ensure that all their older guests could relax in comfort and enjoy the party. 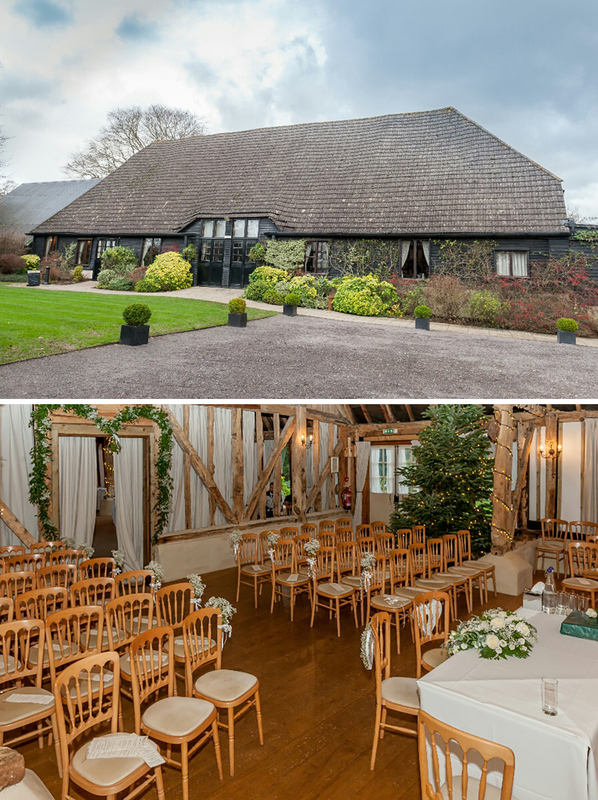 After discovering Clock Barn online, on Facebook, Emma and Shane knew they had to book a visit to view the exclusive use wedding venue. They wanted somewhere that was unique and suited to a winter wedding; a place that had real wow factor. Emma and Shane had secured an early December wedding date and so wanted to style their wedding with Christmas in mind. They had a beautifully decorated Christmas tree by the door of the Barn and added subtle details to both the ceremony space and wedding breakfast tables. For their ceremony décor, the pair opted for a white petal scattered aisle and added delicate bundles of gypsophila to guests’ chairs. 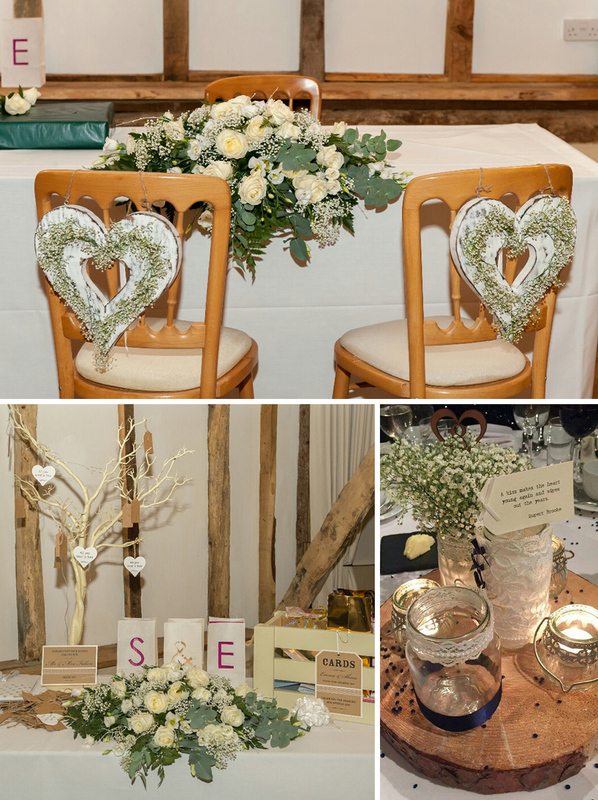 In the reception space, Emma and Shane added a few handmade touches to complement the personalised feel of the day. They used jam jars wrapped in lace, rustic log slices and navy beads to create pretty centrepieces. They also added ivory pom poms to the grand oak beams. When it came to their attire, Emma, Shane, and their wedding party dressed with the winter climate and the chic colour palette of ivory and navy in mind. Emma showed off her unique style in a vintage, full-sleeved lace dress, which had a beaded detailed back. Shane wore a three-piece suit teamed with an ivory cravat while Emma’s seven bridesmaids wore navy gowns and her two flower girls were dressed in white. 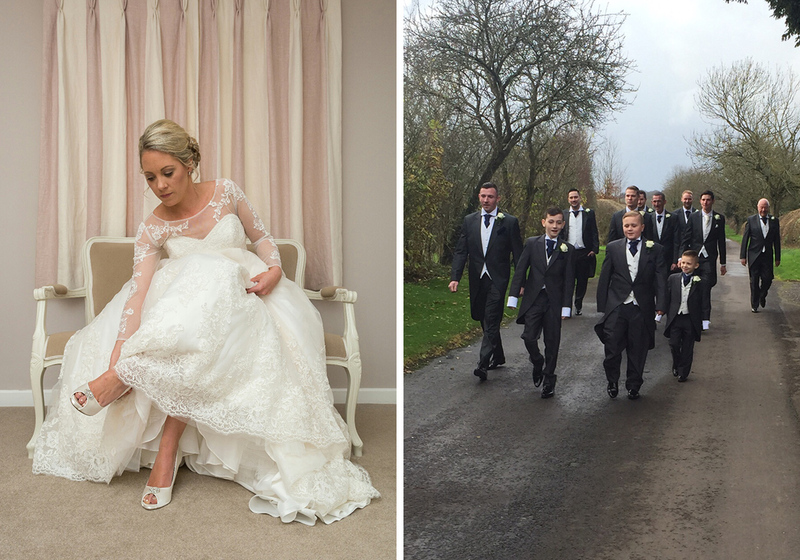 Emma and Shane arrived at Clock Barn on the morning of their December wedding to get ready for their special day. Emma got ready in Lavender Barn, where she had the final touches to her big day hair and make-up. The pair also made transport arrangements for their guests, organising coach transportation to the venue. 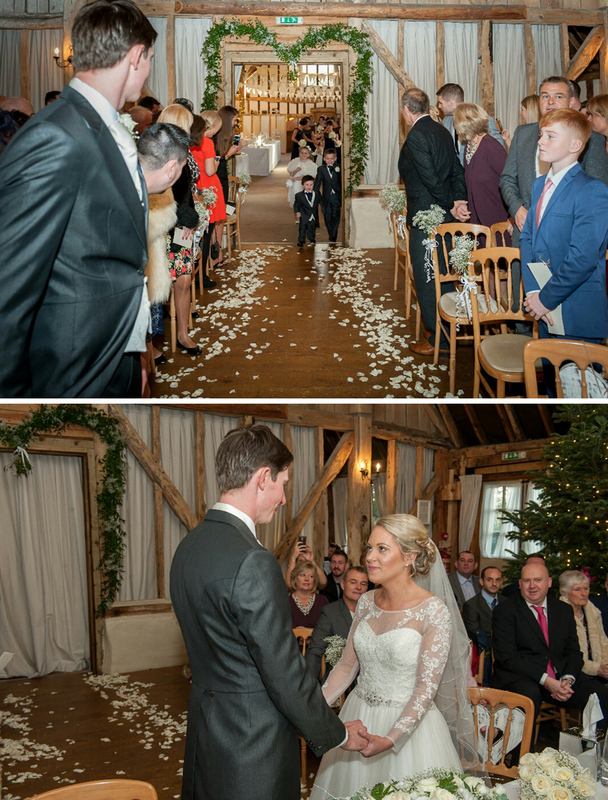 The pair tied the knot at Clock Barn. They had asked one of their youngest family members to take on an important role of the day as a ring bearer – which he did in style! With the formalities over, the couple and their guests tucked into a three-course meal. To start, they chose the famous Scotch egg and bacon dish. A beef main and a winter crumble followed. As the celebrations continued into the night, Clock Barn was transformed into the ultimate party venue. Emma kickstarted the celebrations with two first dances – one with her father and a traditional first dance with Shane. As the party went on, older guests relaxed in the comfortable Stable Room, with its fireplace, and younger guests danced the night away on the dance floor. “Clock Barn had everything we needed and a relaxed, friendly atmosphere.” – Emma.